Las Vegas Nevada, USA – In a very rare occasion, a UFC Fighter showcased his talent outside the Octagon and in an unsanctioned event. UFC Bantamweight Fighter Urijah “California Kid” Faber, pummeled radio host Jason Ellis in an intermission match at the latter’s annual Ellis Mania celebrity boxing match and party at Hard Rock Hotel and Casino. The California Kid, who is set to lock horns with former Bantamweight Champion, Frankie Edgar on May 16 at the Mall of Asia Arena, Pasay City Philippines for the UFC’s first ever Philippine Invasion, exhibited his boxing skills and gave the radio host a serious beating. 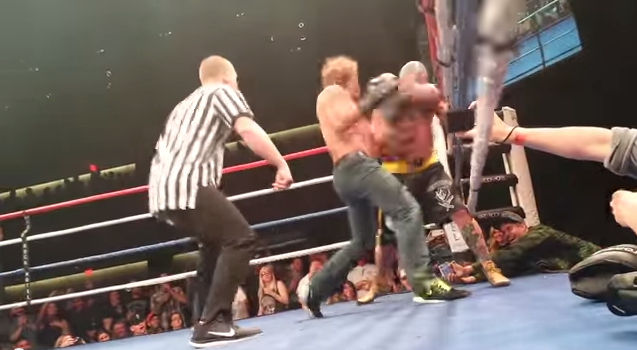 Faber climbed up in the ring and boxed with Jason Ellis for a little over a minute in an unusual fighting gear. In a pair of jeans and sneakers. Yes, Urijah was in jeans instead of his usual MMA shorts. Nevertheless, he still clobbered Ellis with barrage of punches to the body and head. Jason Ellis is not your typical type of DJ with a sweet and charming voice. The heavily-tattooed radio host with proper boxing stance and footwork gave his best and exchanged decent blows with Urijah Faber. After the bell sounded, the gassed-out radio host moved to his neutral corner and approached by Faber for a job well done. He sat on a stool while gasping and panting hard for couple of minutes and surprisingly stood up and went all in for few more rounds against two different opponents.